Do you DIY? Love Metallics? I have two really serious questions ladies….do you love to DIY? Do you love the glam look of metallics? Then this post is written just for you! I have scoured the internet and these are my favorite DIY faux finishes using the glam of metallics! These talented ladies definitely put the “glam” in glamorous. 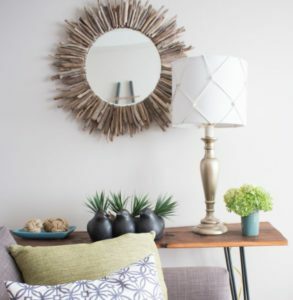 But enough from me…let’s get on to these amazing pieces and DIY’s! 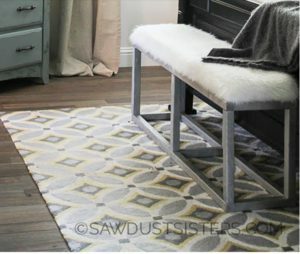 First up is this beautiful DIY Upholstered Bench with Faux Metal Frame courtesy of the Sawdust Sisters. These ladies know how to glam it up! I love how easy their instructions are to follow. I think this has been added to my to do list for my master bedroom makeover for sure! Next up is another beauty from Sawdust Sisters. These DIY Sparkly Modern Wall Hooks are one of my all time favorites because, well I love glitter of course! Is there a better way to glam it up? I see this on the horizon to hold stockings at Christmas! This DIY Nautical Table Lamp Makeover from Sustain My Craft Habit is to die for! Especially if you are looking for that coastal feel. This just gives me all the feels! 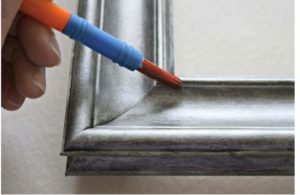 The Handy Man’s Daughter gave me some serious inspiration with this tutorial for a Faux Aged Silver Picture Frame. And the cool thing about this one is you can use it on mirrors, candle sticks, coasters….I could be here all day, seriously! 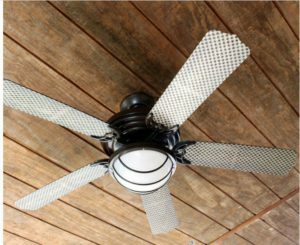 Tag and Tibby transformed this plain old ceiling fan into a really cool piece with their How To Paint A Ceiling Fan Tutorial. 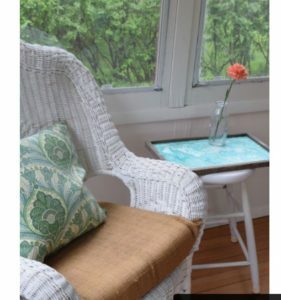 Such an easy an affordable way to quickly update a space! 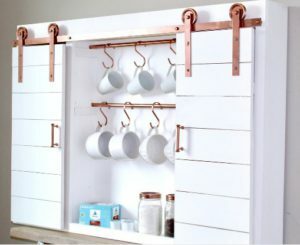 I am obsessed with coffee, so therefor, obsessed with this DIY Barn Door Coffee Bar Center brought to us by Handmade-Haven. Ummmm, YES PLEASE! This next one is a little different, but I’m not any less in love with it! Designer’s Sweet Spot knocked it out of the park with this Marbled Wooden Tray in Just 15 Minutes! By Brittany Goldwyn gave me life with this awesome idea! 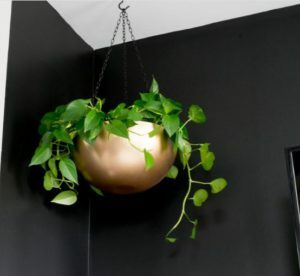 I have no green thumb, but since faux is all the rave, this DIY Stainless Steel Bowl Hanging Planter is definitely getting a test drive! Last up, but definitely not least, we have Thirty Eighth Street with this awesome How To Create A Restoration Hardware Faux Finish tutorial! I am super excited about this one. If you have been following me you know I am refinishing furniture finds for use in my remodeled home, and this baby will definitely be used! 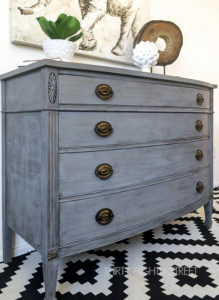 That wraps it up for this round up of DIY finishes! I hope you had as much fun as I did getting so much inspiration! Check these ladies out for all of their other DIY ideas and tutorials for much more. Which one was your favorite? Be sure to post your comments and questions in the comments section below and be sure to check me out on Instagram and show me what you create! I love seeing all of your beautiful creations! Beautiful metallic projects! Thanks for putting this together, I enjoyed all of them! Thank you so much Carrie! And thank you for your participation. I can’t wait to try it! I’m a huge DIY fan from the start. Also, I do love saving money. Naturally this turns itself into re-purposing items through refinishing. I really like this page for all the ideas. Keep the good work coming! I love your site! and I was browsing the internet looking for metallic finishes for a project that I’m doing and you’ve given me some great ideas that I’m going to try out, many thanks! Glad we could help Helen! Awesome! These are all really gorgeous. I would love to try this metallic look on a few things at home and it could be quite masculine being metallic and using a silver for a boys room. Thanks for the great inspiration! These are great finishes. I think my favorite is the wooden marbled tray. Does it really only take 15 minutes? I think all of my painting projects take at least fifteen minutes to set up and clean up. I got mine done set up and clean up in about a half hour total, but I did it inside. Had I done it outside, it probably would have only been 17 mins. tops! These are some great products, thanks for putting this list together. Do you have a ‘top 3’ of these, are are they equally good? I love them all! But the first three I am working on, the Glitter wall hanger, the bench, and the planter!! Wow, what a great idea! I applaud you for your work and this blog covering crafts. 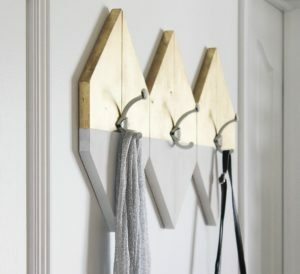 I love the wall hooks and the idea of doubling as stocking hooks at Christmas. Thank you. 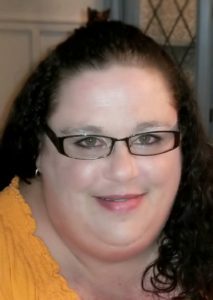 My pleasure Vanna! I’m so glad you enjoyed it! Wow, there are some truly awesome ideas here, especially that stainless steel bowl hanging planter. That looks like a project that I can get into! I really like the black version that she did as well. If I cannot get the supplies that are suggested, do you recommend any particular brands of metallic paints that can be subbed? I really like the Krylon metallic spray line, and Rustoleum metallic sprays are awesome too!